If you’re feeling tired and sluggish or you feel embarrassed about how your belly, hips and thighs look… then now is the perfect time to do something about it. The kids are back at school. You’re back in your routine. So now you can now focus on you. And kick-start the positive changes you need to make so you look and feel better than ever. With the right tweaks to your diet (which I can show you) it will profoundly affect your thyroid and metabolism. And transform you from a fat storer… to a fat burner. Now kick-starting your change is easier than ever before. That’s because I have developed a new system to help you get going. In the past working with me meant you had to come in to the clinic for weekly or fortnightly consultations. So for these reasons I developed a new system that solves all the above issues and gets you even better results. It’s the Fat Belly To Flat Belly Online Program. With the advancements in technology it’s now possible to run consultations completely online. I can talk to you and you can talk to me from anywhere in Australia. Or even the world. There’s no need for you to be able to physically come to the clinic. We have your consultation in the comfort of your own home. So no matter where you are… out of Sydney, or interstate, or you’re on holidays, we can connect and I can consult with you. But the really awesome thing about online consultations is not just that you and I can connect but we can connect with others at the same time. Instead of doing one-on-ones the consultation is run as a small intimate group meeting. This way it’s not just you on your journey all by yourself. You’ve got comrades there with you. You have other like-minded women and men alongside of you. Who understand what you’re going through and are there to support you when you need it. But unlike Weight Watchers meetings you don’t have to weigh-in in front of everyone. I’m the only one who knows your weight. And with this online group meeting we’re together for an hour every week (5 weeks) of the program. Not just 20 to 30 minutes like I do with face-to-face patients. So that means I can give you more specialist advice. I can address more of your issues and help you solve more of your problems. Plus, because of the extra time you’ll also get help with your mindset. For the final 15 minutes of each session my partner and clinical hypnotherapist Frances Bueno will take over. She’ll show you some simple but powerful techniques to change your thinking in relationship to food. She’ll demonstrate to you and give you tools that help stop you self-sabotaging, improve your self-image and do the things you know you should be doing. Plus, each week you will also get a hypnotherapy recording from Frances that addresses a core mindset problem such as sticking to your program, resisting temptation and binge eating. And these are soooo helpful because they’re probably these reasons your past weight loss attempts have failed over the long term. Changing how you think about food and yourself, not just only changing your diet, is the biggest secret to your long term success. And it’s the secret behind Lyndi’s phenomenal success. 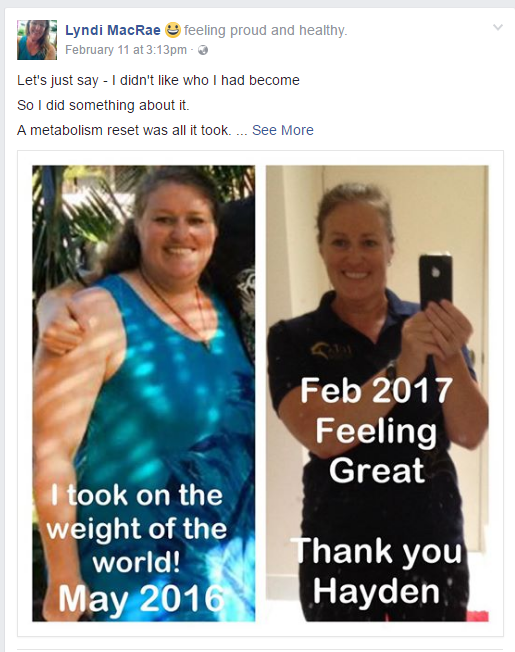 Watch this video and hear how this synergistic approach was Lyndi’s saviour. Now that’s not all you get. I have put together an online resource that makes it possible for me to connect you with me and others on your journey 24/7. I have set up a specific Facebook group page that’s only accessible to Fat Belly To Flat Belly Online Program members. This gives you a place to go to and get the support whenever you need it. So whenever you feel down or need some help or you’re after some meal inspiration you’ve got friends to call on. In this Facebook group you can post questions. You can answer other member’s questions. You can post tips you’ve found helped you. You can read tips other members have posted. You can see what other members have been cooking or you can post up what you’ve cooked to inspire others. It’s just a fantastic way to keep you connected. And because it’s Facebook you can tap into it any time of the day or night. It’s like you’ve got other healthy people living with you, including me. I’ll be in the Facebook group too to help you with any specialist advice you need. So the Fat Belly To Flat Belly Online Program actually gives more access to me than ever before. And what’s even better is it costs you less than what you pay for five 20 minute in clinic consultations. It only costs $80 a weeks for 5 weeks ($400) or a one off payment of $375. That saves you a minimum of $1000 even though you get more time with me and Frances. Then I’ll give you a call so I can give you the complete details about how it all works and answer any questions you have.